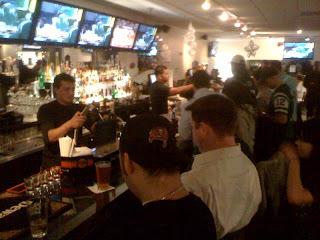 Roosevelt Island's Riverwalk Bar & Grill is a great place to watch the NFC and AFC Football Championship games on Sunday with it's 14 large screen TV's, friendly people, tasty food and a football bar menu including excellent 25 cent chicken wings - can't beat that. 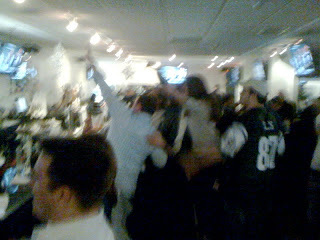 Even better if you are a J - E - T - S Fan. Yeah, I know the J -E- T-S chant is annoying if, like me, you are not a Jets fan, but I figure after so many disappointing seasons, they're allowed. 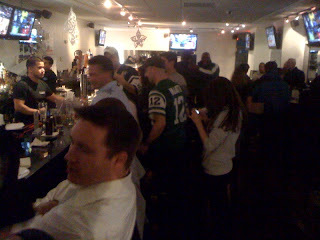 Vikings, Saints and Colts fans are welcome as well. For me, I'm just hoping for two good games since my Green Bay Packers were already eliminated from the playoffs. In the past, I would root against the Packer rival Vikings but I have always been a big Brett Favre fan and still am even after his departure from the Packers. So I'm conflicted on this game. The only solution for me is that Favre plays great but the Vikings lose! At least I know that I will enjoy the chicken wings and sweet potato fries. YUM! Adonis Taylor at Skater Island in NYC from Art of Rolling on Vimeo. The Art of Rolling held a session yesterday with some of NYC’s emerging talent (Photos will be posted soon) at Roosevelt Island or as it’s also refered to “Skater Island.” Adonis Taylor managed to get it in with a nice soul to drop before security came and broke up the session. The combination of walkways and road make the perimeter of Roosevelt Island a fairly pleasant skate, especially during the summer when you can catch a breeze off the East River. The entire route is about four miles and almost entirely flat, so you can do it in a very leisurely hour. In general, this "trail" is in good shape, although the sidewalks are often brick or wood rather than concrete or asphalt. On the east side of the island, by the bridge to Queens, there is a set of steps of just about the right number and steepness for stair newbies to practice bashing. You'll probably run into some neighborhood kids doing just that. There were 14 incidents of Assault, 10 Grand Larcenies, 9 Burglaries, 5 Robberies, 2 Grand Larceny Autos and no Roosevelt Island murders or rapes in 2009. Earlier this week, there was a robbery in the Motorgate Garage and an assault as described by the daily Roosevelt Island Public Safety Reports below. 0700hrs 01/15/10 - 0700hrs 01/16/10Robbery- Three male subjects robbed victim in the motorgate, motorgate attendee reported robbery to PSD and NYPD. PSD apprehended subjects, subjects were transported to PSD then 114th precinct. Assault- 2 subjects punched an adult male while he was talking on a cell phone. They fled. 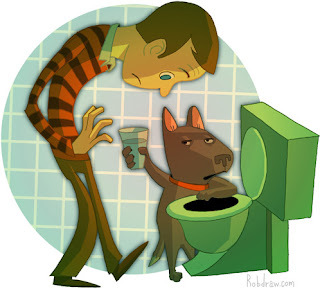 PSD, NYPD responded and conducted a search with negative results. EMS transported the male to the hospital. 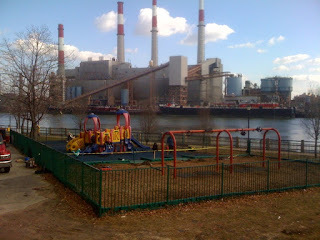 Click here for the archived 2009 Roosevelt Island Daily Public Safety Reports. 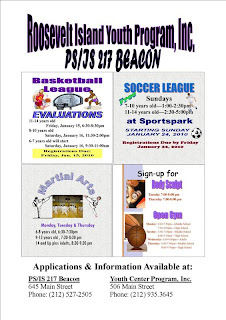 Roosevelt Island Youth Center Winter Programs For Soccer, Basketball, Martial Arts and Body Sculpting - Give It A Try Kids! 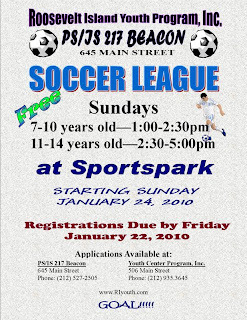 Any Roosevelt Island kids out there interested in playing some winter soccer. 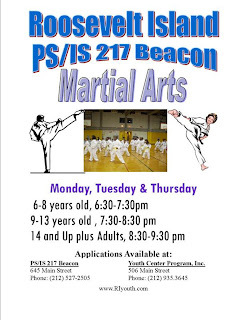 If so, the Roosevelt Island Youth Center and PS/IS 217 Beacon Program may be the place for you to practice your skills for the summer and have some fun during the rest of the winter. Registrations are due by Friday January 22 and games begin on Sunday January 24 at the Roosevelt Island Sportspark (250 Main Street). 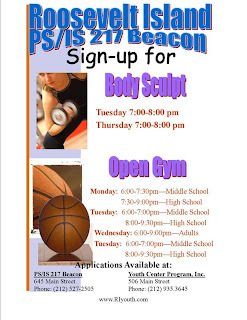 Applications are available at the Youth Center (506 Main Street) and PS/IS 217 Beacon (645 Main Street). Looks like fun. Why not give it a try? Also, don't forget that Wednesday is Ping Pong Nite at Sportspark and adults are welcome as well. 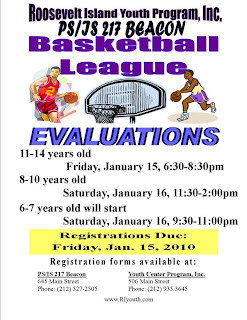 UPDATE - 1/26 - The 6-7 year old Saturday basketball games take place 9:30 - 11 A.M. not P.M. as shown in the flyer. 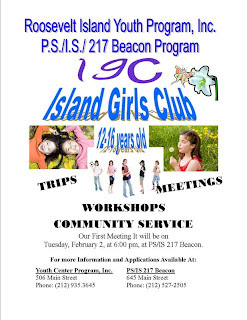 There's also a Roosevelt Island Youth Center Girls Club. 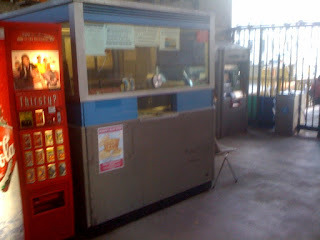 Will a Tram Station Attendant still be in the Manhattan Station Booth during all hours of Operations when the new Tram System is in place? Not now clear whether there will continue to be an attendant in the booth on the Manhattan side. Since no cash is used in the turnstiles and the Metrocard machines are all entirely self operating, as the MTA has pushed, we have asked "what is the need?". We are contemplating security camera usage for any concerns about safety. Operational staffing remains to be finalized as the reality of real operations become available. Efficiencies are devoutly to be desired as part of the expected return on capital investment. Hope all is well. As you know, I am the director of Island Kids, Inc an Island organization providing enrichment programming for toddlers. 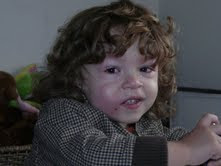 Today, a 2 1/2 year old child came to one of our classes with a bruised and swollen face (see attached pictures). While at the tot lot yesterday, he was hit in the face by a swing, despite the fact that his mother was right by his side. The pictures actually minimize the damage and had it occurred closer to his head, it could have been a tragic situation. I know that Rachel Reid Chung has expressed her concerns about the lack of fencing around the swings and I think this recent event reiterates the importance of the situation. I hope that you will expedite the instillation of the fencing, which should include a gate with a latch. Thank you in advance for your response to this matter. Your concerns are being forwarded to Public Safety and Engineering to expedite the alteration to the swing area. We will explore the possibility of temporarily dismantling the swings till the situation is remedied. Thank you so much for your quick response to all of this. 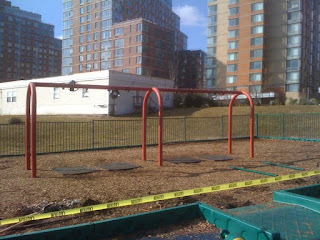 Swings are temporarily immobilized until fence is fully installed, which should be by end of week. Dr. Grimm is seeing him tomorrow as I have noticed a hard mass under his jaw. The area is getting more red now and will take some more images in the morning. I have been afraid of this happening for the last 2 years, or rather since wyatt started crawling. I have been watching him like a hawk on the playground and was always worried about the swings. Luckily so far, he seems fine but we sure got lucky, it could have been his eye or his temple and that would have been a grave situation. 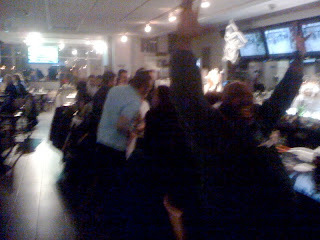 What Has Happened To Roosevelt Island's Grog Shop Liquor Store? What has happened here? You used to be able to pick up a bottle of wine in an emergency, but the stock is now much reduced and very weird. Don't know if this is the cause of problem but Archie Seale the owner of the Grog Shop passed away last September. 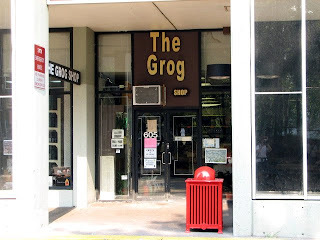 According to RIOC's Proposed Budget for fiscal year 2010-11 (Page 11) , the Grog shop is paying $32 per square foot for 1,545 sq. ft of space on a lease thru February 2023. RIOC has issued the following No Water Advisory for the Octagon beginning Thursday, January 21 at 6 PM. Please be advised, on Thursday, January 21, 2010 at 6 p.m. DEP will be shutting down the water main that supplies The Octagon Building. The shut down is necessary for the installation of the Octagon Comfort Station and DEP site sanitary sewer. The shut down will be from 6 p.m. to 12 a.m. The Octagon Building is the only building that will experience "No Water", all other buildings may experience dirty water when the main is turned back on. 12/19/2009 888 Main St Victim stated male subject recently rented a room from her. Victim stated subject stole two jewelry chests containing $30,000 worth of jewelry and has not returned to the apartment. Victim will file an NYPD report. Cell phone number of subject was supplied. Investigation- A resident sublet an apt. The subletee sold resident's property. PSD and NYPD responded. The matter was referred to Small Claims Court. Take The Roosevelt Island Temporary Ferry Tram Outage Survey - Will You Use This Ferry Service Option During Morning Commute? Please be advised that the Roosevelt Island Operating Corporation will be conducting a Ferry Service Survey to solicit information about passenger interest in such a service during the scheduled Tramway renovation project. The survey responses will be collected until January 31st at 5pm. Hard copy responses should be returned to either the Public Safety Department or the survey boxes at the Tram Stations. The survey is below. Please click here to take the survey online. The Roosevelt Island Tram is expected to be out of service for extensive renovation from March 1, 2010 through August 31, 2010. To better serve you, we are researching transportation options in addition to the F train and red bus shuttle service. Red bus service will be running every 1/2 hour to the E,G,R & V subway stop at Queens Plaza during rush hours and to 2nd Ave. and 58th Streets during non-rush hour periods. 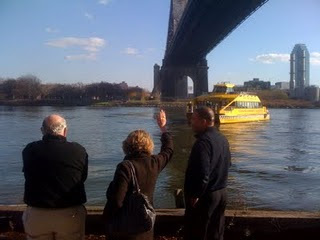 Having met with ferry service providers, maritime engineers and the City agency overseeing expansion of ferry service, the one additional option which may be feasible on a temporary basis until the Tram is back in service is a ferry from the East side of Roosevelt Island (dock behind the steam plant) to the East 35th Street Ferry Terminal. The vendor has proposed environmentally friendly vessels which have been specifically designed for passenger comfort including upholstered seating and restrooms. Service would be Monday- Friday from 7:30 AM to 9 AM, leaving every 1/2 hour. The one-way travel time will be 10-minutes. In order to determine whether the service will be economically viable, the vendor has asked us to conduct this survey. 1. How many weekday mornings do you use the Tram? (only count departures from RI) ______ /week. 3. Would you use morning rush hour ferry service to East 35th Street during the Tram renovations? Y___ N___. a. If yes, would you be willing to pay $3 for a one way ferry ticket? Y ___ N___. b. Would you be willing to pay more than $3 for a one way ticket? Y___ N ___. c. If no, would a cross-town bus from the 35th St. ferry landing change your mind? south on 2nd Avenue, turn east on 34th Street for return to ferry terminal. ___Yes, the bus transportation would change your mind. ___No, I would not use the ferry service. 4. If the bus link would change your mind, would you be willing to pay an additional $2 for the bus service? Y___ N___. 5. How many days would you take the morning rush hour ferry ______ /week? ___Lack of comfortable waiting area, ___Too Expensive. Please complete and return this survey to the Public Safety Department (550 Main Street), or to the survey box at the Tram stations. All surveys must be returned by January 31, 2010 at 5PM, to be considered. You can also complete this survey by visiting the following website: http://rioc.ny.gov. Thank you. Please let me know if you fill out the survey and what you think of the proposed idea.